The ships that came and went in 2015. As we reach the end of 2015, it’s time to reflect on our year in Bremerton. One of the joys of my job is that, each day, I learn something new and fascinating about the town in which we live. In painstaking fashion, I have whittled down the most fascinating things I learned in Bremerton this year to 10. Enjoy! Never mind a grocery store. Plop 300 of the brightest minds in astronomy in downtown Bremerton and you get packed restaurants and bars, night after night. 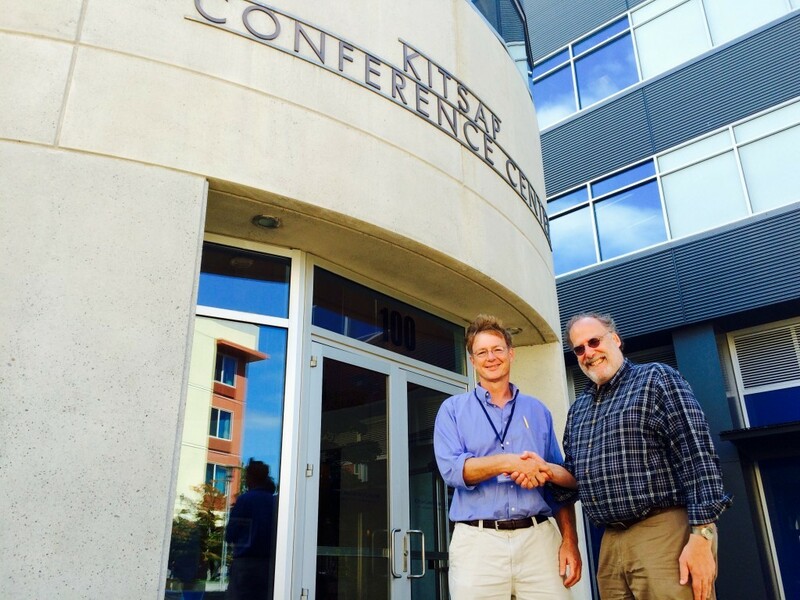 I am oversimplifying a bit, but the Large Synoptic Survey Telescope conference in Bremerton in August was by all accounts a smashing success. None of this would have happened without the efforts of Bob Abel, an Olympic College physics professor. He convinced the powers-that-be, who work on this very special telescope, that not only should they come to Bremerton, they should also share their knowledge free of charge with the community events all week long. 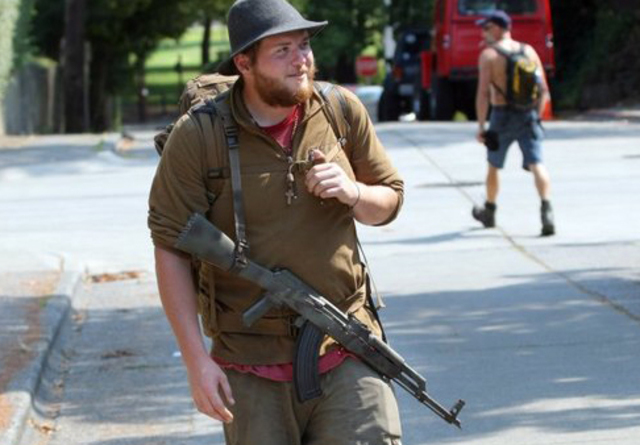 For months, I had heard about a guy walking around town with a rifle over his shoulder. Who was he? And why did he feel it necessary to openly carry such a weapon? In my mind, it cried out for a story and I contemplated how I would get in touch with him. After a post ran on our Facebook page, Kyle Davis actually reached out to us. So I spent a couple days getting to know him, even following him on his morning commute across the Warren Avenue Bridge. Davis told me he carries the gun to protect his family. He also hoped that it would serve as an inspiration to others. I’d challenge you to go elsewhere in America and find the mesmerizing entertainment you get, almost daily, at the corner of 11th Street and Warren Avenue. There, the man known as the Bremerton Ninja has transformed a rake handle into a staff and twirls it with the grace and dexterity ready for a Vegas stage. I myself felt inspired the day I spent with Brandon Duran at the intersection. His motivation for enduring the elements to entertain drivers was to, “Build self-confidence,” he told me. Safe to say he’s done so: He’s still going, and his Facebook page is up to 861 followers. Waste Management pays the city of Bremerton $125,000 for the privilege of picking up garbage from the city’s residents. And, due to the public health risks festering trash could pose, the company has been picking up the garbage here regardless of whether or not the customer has paid. 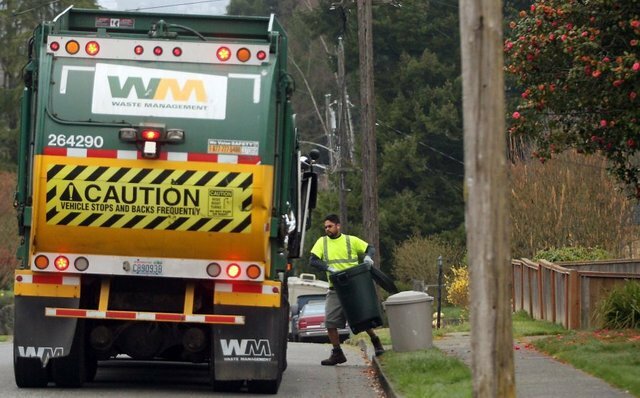 Roughly one in five customers in Bremerton is now behind on their garbage bill. Coincidence? In consultation with the city, Waste Management will be cutting off customers starting in 2016. Should the garbage pile up, the city could levy fines on customers. We’ll see in the coming months how this goes. Since I started covering Bremerton, one thing I’ve found truly perplexing is how this city zigzags like a bad game of Tetris. I wonder about the inefficiencies of delivering government services, whether you’re in neighboring Kitsap County or the in city. Kicking off what I hope to be a series of stories examining those zigzags, I tackled in 2015 Navy Yard City — a neighborhood that in the county. The area has long been home to residents who feel taxes and regulations will increase if they become part of the city. 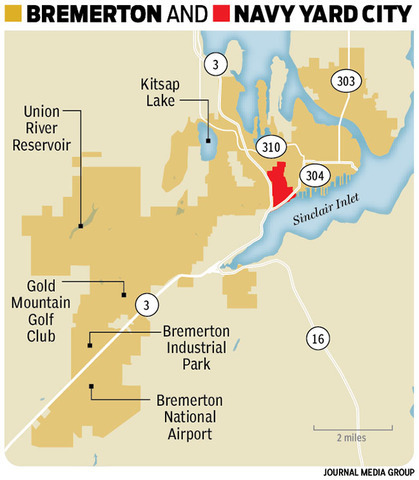 But the area is planned to become Bremerton under the state’s Growth Management Act, so county officials aren’t exactly thinking of this portion of their territory as a long-term relationship. In 2016, I hope to tackle similar areas like Rocky Point and West Hills. Bremerton is full of beautiful conifers, but the two most iconic are on Veneta Avenue, between Fourth and Fifth streets. They’ve stood tall there for decades, and are so beloved that most people I’ve spoken to prefer a future where the trees’ roots slowly destroy and shut the adjacent road. But how did they get there? I have two theories. The first is that Sero Migliavacca, a prominent Bremerton banker in the early 20th century (and the city’s first millionaire) helped plant them. He was from California, home to redwood country, and in 1910 built the fanciest home in all of the city at the corner of Fourth and Veneta. It’s still there today. The second theory is that they are relatives of the sequoia inside the Puget Sound Naval Shipyard. 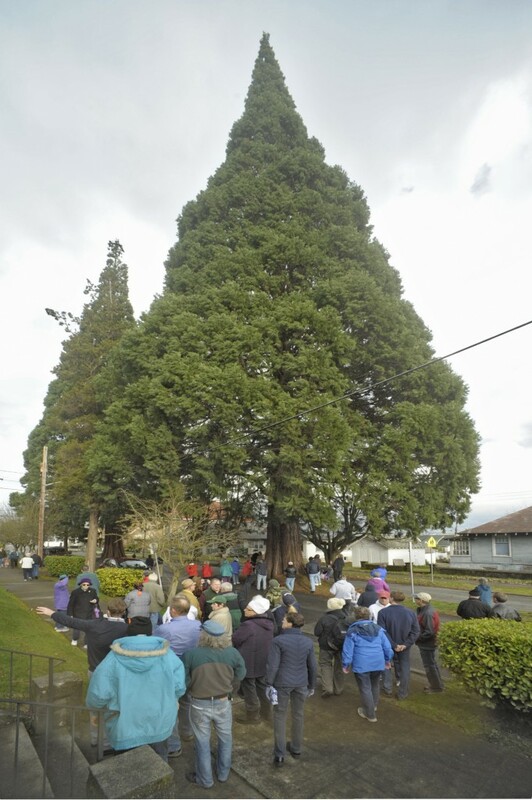 Around 1900, someone gave a sequoia to the commanding officer of the shipyard as a gift — and the tree still stands, less than 1/3 of a mile from the Veneta trees. It may be as simple as a bird somehow relocating a sequoia cone a little north. But the exact answer? We may never know. Every time I walk by the submarine sail that sits in the concrete at the entrance of the Harborside Fountain Park, I think of the daring missions its crew completed. The USS Parche is the most decorated vessel in Navy history — and for good reason. While many of its missions are still classified, the book “Blind Man’s Bluff” claims the boat wandered into the lion’s den of the Soviet Union — our Cold War enemy’s most secure waters — and tapped into communication cables chock full of Soviet secrets. Every sailor aboard was prepared to die had the vessel been discovered. It’s an amazing piece of history that we’re lucky to have in Bremerton. Bremerton’s Roxy Theater, which opened in 1941, is steeped in history. But it has been closed for a few years now after a church vacated it. Many of you toured it with me in July as part of a Story Walk, and witnessed the opening night newsreel that recently surfaced. But the big news came in November, with the announcement that Sound West Group had signed up to purchase the art deco theater. They plan to reopen it for events, and I know many of you are excited for that to occur. 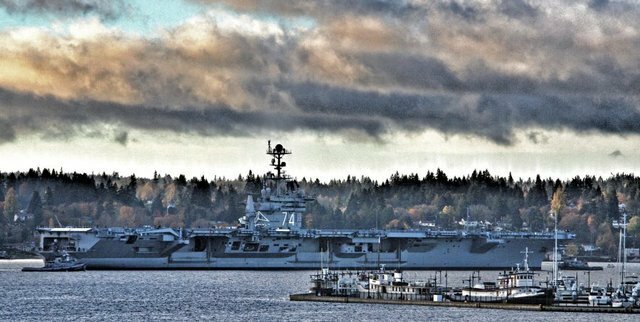 If you like watching mammoth ships come and go from Bremerton, 2015 was a banner year. Two aircraft carriers, the Constellation and Ranger, both left the mothball fleet for good. The Stennis made repeated trips out to sea for training. And the Nimitz was towed here to start 2015 (and will stick around). Boat-watching wasn’t so bad either: Bremerton’s namesake submarine made a stop here and many others came to the shipyard and to Naval Base Kitsap-Bremerton. That includes the Seawolf and the Connecticut, the two subs that are home-ported here. Aside from being one heck of a bartender, Annie Herinckx is also a marketing genius. The manager of The Garage Bar & Grill on Kitsap Way created a menu of Bloody Marys and the buzz reached epic proportions in 2015. Each menu items includes not only the ingredients of the iconic drink but also: Burgers, shrimp, grilled cheese, and pretty much anything else you can attach to a glass without it falling over. This is a far cry from the bar I had written about a few years ago — one with the distinction of having more drunk drivers caught leaving it than any other in the state. Its metamorphosis into The Garage is quite the success story. “Remember the article you wrote that killed my bar?” he asked. He went on to tell me about all of the changes they had made to their establishment. I’ve witnessed them myself, and if you haven’t gone to The Garage for breakfast, or any other meal recently, you are seriously missing out. Happy new year, Bremerton! Oh — and if you made it this far, here’s the 10 things we learned in 2014. Thank you, Josh, for your enlightening and entertaining reporting. I always learn something new about Bremerton when reading your words. Your enthusiasm for this town is contagious. Happy and blessed New Year.